Designed to make it easy to teach STEM skills and for students to become creators of technology, the new Danish robot aims to inspire students to engage with science, technology, engineering and mathematics to alleviate the shortage of qualified candidates that is estimated to cost UK businesses £1.5 billion per year. “We have chosen London for the world premiere of Fable Spin, which makes robot technology widely accessible and inspires imagination while teaching multidisciplinary skills in the classroom. Fable Spin is the latest offshoot from the Fable System, which gives everyone the fantastic feeling of being able to programme a robot. The Fable System ensures successful programming, innovation and creativity in teaching and is robust enough for rough treatment in the classroom,” says David Johan Christensen, CEO of Shape Robotics, the company behind the Fable System and the new Fable Spin, which launches January 23. The Fable System assists learning at all levels, from the comprehension of technology in primary and secondary school, through to the teaching of more advanced mathematics and informatics in vocational training programmes in industry and construction. “Due to its ease of use and applicability, Fable can be used to teach everyone – from inexperienced children to robot scientists. Its resemblance with professional robots also means that it can be used at vocational training programmes for training programming, automation, computer vision, CAD design and artificial intelligence. Fable covers the entire spectrum and is designed for 21st century learning,” explains Moises Pacheco, CTO and co-founder. 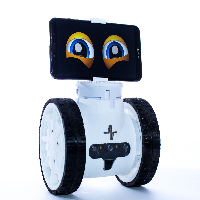 Pupils can easily programme the Fable Spin to move, play football, tidy up, dance, wrestle, monitor rooms, be social or transport items from A to B. Fable Spin has wheels and a number of integrated sensors that allow it to avoid obstacles, perform search and rescue missions and navigate by lines. The Fable System invites anyone from the age of three through to grown-ups to get to grips with the programming languages Blockly or Python. Shape Robotics’ Fable System is already widely deployed in Danish schools, helping to sustain the country’s position as one of the most advanced nations for robotics and automation. It is hoped that widespread adoption in the UK help it shake off its undesirable status as the least automated G7 country and the only one with a robot density below the worldwide average.